Some 2000 athletes from almost 60 countries will race in the biggest and most prestigious Skyline Scotland event ever this weekend. 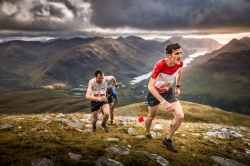 Taking place in Kinlochleven, amid a magnificent and technical Scottish Highlands landscape, the festival of Skyrunning extends to four days of extreme racing. Among the athletes competing this year are former world champions and Skyrunning super stars, including Kilian Jornet, Luis Albert Hernando, Pere Aurell, Jan Margarit, Laura Orgué, Maite Maiora and Sheila Avilés from Spain; Stian Angermund-Vik from Norway; Britons Jonathan Albon, Tom Owens and Holly Page; Hillary Gerardi, Sage Canaday and Dakota Jones from the US; Ragna Debats from the Netherlands; André Jonsson and twin sisters Lina and Sanna El Kott from Sweden; Mira Rai from Nepal; Japan’s Rui Ueda, Yuri Yoshizumi and Dai Matsumoto; and recent UTMB winner Francesca Canepa from Italy. Local Scotsman, Finlay Wild, the nine-times winner of the Ben Nevis race, is set to compete this weekend, too. The runners will contest an impressive line-up of races, including the Skyrunning® World Championships (September 13 to 15), of which the last race doubles up to count in the Golden Trail Series (Sept 15) and the MIGU Run Skyrunner® World Series (Sept 16). It’s the first time that Scotland has hosted the biennial International Skyrunning Federation (ISF) World Championships, including the Salomon Mamores Vertical Kilometer® (VK), the Salomon Ben Nevis Ultra (ULTRA) race and the Salomon Ring of Steall Skyrace (SKY). The fourth and final day of competition is saved for the flagship Salomon Glen Coe Skyline® race, now in its fourth year. The Glen Coe Skyline® is reputed to be one of the world’s most challenging mountain races and is one of eight races in the hotly contested Migu Run Skyrunner® World Series. Kilian Jornet returns to defend last year’s win – and course record – in the 52km / 4750m Sunday race. Impressively, he will also race this year in the Salomon Ring of Steall Skyrace the day before. The four races of the Skyline Scotland event are organised by Ourea Events, which is behind the legendary Berghaus Dragon’s Back Race® held in Wales and Scotland’s Cape Wrath Ultra®. He continued: “We are delighted to be to hosting the Skyrunning World Championships for the first time, with the Vertical, Ultra and Sky discipline races attracting more than 1800 runners, as well as the fourth outing of the iconic Salomon Glen Coe Skyline®.